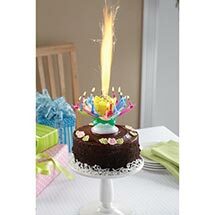 Add wow to any birthday party with a cake-topper that's part candle, part Fourth of July fireworks display. On lighting, it sends up a sparkler and starts playing "Happy Birthday." The petals fold back to reveal 12 lighted mini candles, and the whole thing starts to spin, still playing "Happy Birthday." One use only, always with caution and adult supervision. 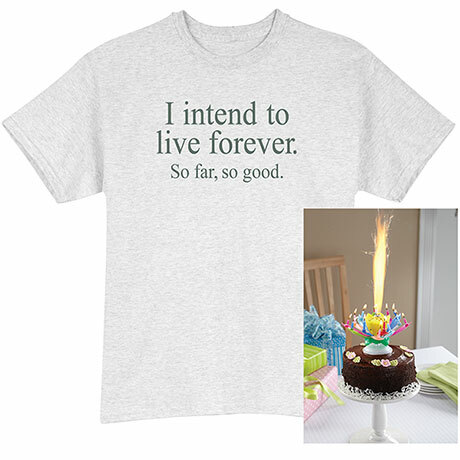 Included 99/1 Cotton/poly blend t-shirt is a gotta-give on any milestone birthday. A little positivity counts for a lot. Sizes M-XXL. Imported. Birthday gift set includes one magic musical candle and one t-shirt. WE ARE SORRY BUT THERE IS NO INTERNATIONAL SHIPPING. SHIPPING IS ALSO NOT AVAILABLE TO ALASKA, HAWAII, OR MASSACHUSETTES. NO RUSH OR OVERNIGHT SHIPMENT AVAILABLE. Item can only be shipped within the Continental US.